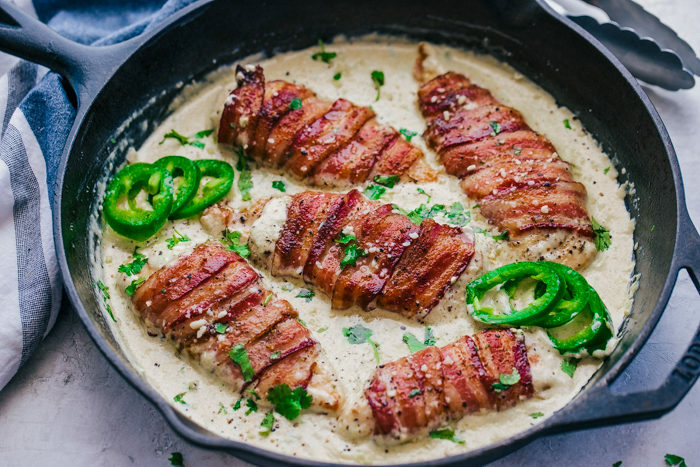 In the delicious world of bacon, this Bacon Wrapped Chicken with Jalapeno Cream Sauce will heat of your kitchen and captivate your tastebuds. By far this is the Best bacon wrapped chicken recipe. Why is it that there are two things in life that make everything better? Butter and Bacon! 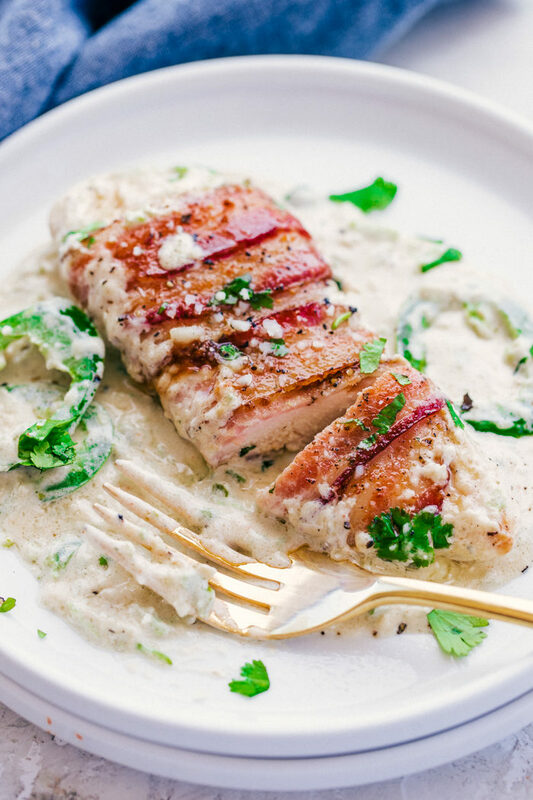 This Bacon Wrapped Chicken with Jalapeno Cream Sauce is truly a flavor powerhouse. The bacon cooks up nice and crispy and keeps the chicken super moist and tender. Then when you add in the Jalapeno Cream Sauce the flavors just explode. The mixture of both the bacon and the jalapeno cream sauce add so much depth to this recipe and it all comes together very easily in one skillet, making your cooking efforts minimal and delicious. Of course, you will always get an approval for chicken wrapped in bacon. How do you wrap chicken breast in bacon? I like starting with thick cut pieces of bacon. Take the bacon and begin at one end of the chicken. Holding the bacon tight at your starting point, wrap it all the way around the chicken to the opposite end. Place the chicken in the skillet seam side down. 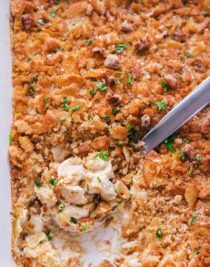 This recipe does have a little kick to it, but with the combination of crispy bacon and tender chicken it tones it down a bit. 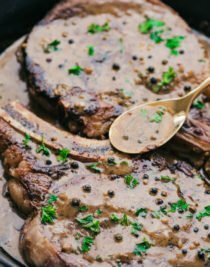 The jalapeno cream sauce is not too heavy so you can really taste all the flavors working together. Keep reading to find out how to cook bacon wrapped chicken breast. How do you make Bacon Wrapped Chicken? Start with thick cut bacon and wrap one to two pieces around each piece of thin cut chicken breast, season with garlic salt and pepper. In a large skillet add 3 Tablespoons of butter and let melt over medium-high heat. Add in the chicken breast and let cook 5 minutes per side. 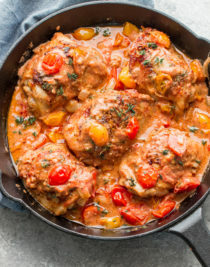 Remove chicken from skillet and serve warm. How do you make Jalapeno Cream Sauce? Add blended sauce to a skillet or sauce pan and heat over medium heat. Add in grated parmesan cheese and stir until melted and combined and serve. Do you have to use thin cut chicken breast? No, but I like to use them because they cook up more evenly and quicker than the larger chicken beast which tend to be thicker. You can use the thicker, regular chicken breast, but I would recommend tenderizing/pounding them so they will cook more evenly. Or if you cannot find thin sliced chicken breast you can carefully slice a regular chicken breast in half with a sharp knife. 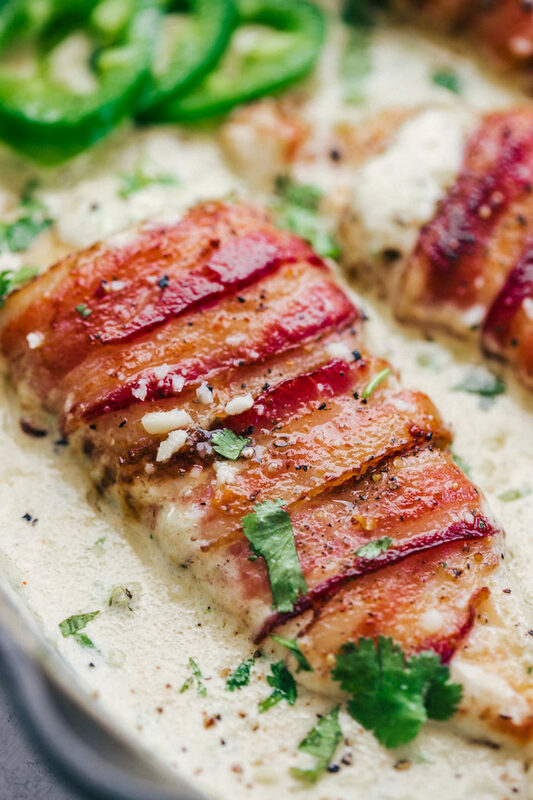 It’s time to make chicken come alive, and this Bacon Wrapped Chicken with Jalapeno Cream Sauce will do just that. Every bite will be sensational, from the crispy bacon, tender and moist chicken, all surrounded by a creamy jalapeno sauce. Dinner doesn’t have to be difficult, but it should always be delicious. 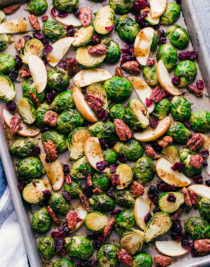 Looking for more bacon recipes? WHAT SIDES GO WITH BACON WRAPPED CHICKEN BREAST RECIPE? 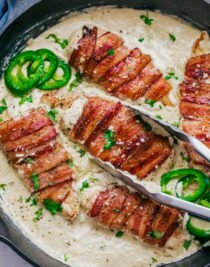 In the delicious world of bacon, this Bacon Wrapped Chicken with Jalapeno Cream Sauce will heat of your kitchen and captivate your tastebuds. Wrap 2 pieces of uncooked bacon around each chicken breast, and season with garlic salt and pepper. Melt butter in a heavy skillet over medium high heat and add chicken. Cook 5 minutes per side until bacon is crispy and chicken is cooked through. Remove from skillet and set aside. In a food processor or blender add: cream, milk, jalapeños, garlic, garlic salt, cayenne pepper, and pulse on high until combined. Pour into same skillet and cook over medium heat about 5 minutes, stirring often. Add in parmesan cheese, and stir until melted and combined. Add the bacon wrapped chicken breast back to the skillet and garnish with cilantro and fresh cut jalapeños if desired. Serve warm. What do you normally serve as a side with this – have you ever tried putting in on linguine. 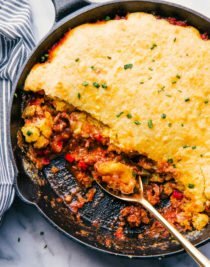 Making it tonight – looks yummy! You could definitely put it over pasta, that would be great! 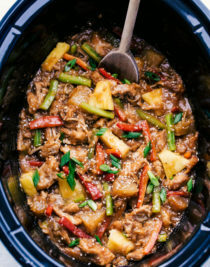 I usually serve it with a green salad and warm sough dough bread to soak up all the yummy sauce. Shannon 🙂 let me know how you like it! I always feel more comfortable cooking chicken in the oven. 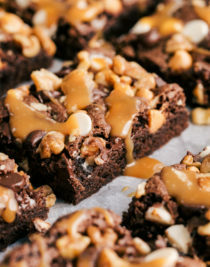 What would u recommend on time/temp if I were to bake this? I would cook them at 400 degrees and check them after 20 minutes. This is delicious! Big hit with my family. I used green onions rather than onion powder. Also, I used chicken tenderloins rather working with breasts. This. looks. amazing!!!!!! 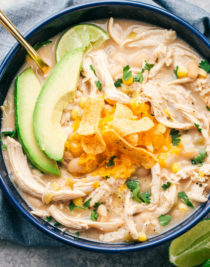 I’m heading to the store to get everything to make this for dinner tonight. I hope you like it! It really is so good! That sounds amazing!! I hope your customers love it. Fresh jalapeño—- do you clean all the seeds out? Yes fresh jalapeno, I cleaned out the seeds, but that is totally up to you.